Release the -- Nah. Forget It. Above: Shonisaurus, favorite paintbrush of giant mythological cephalopods. In a move that should surprise no one, media outlets have picked up and are running with possibly the stupidest, most blatantly ridiculous scientific "discovery" since the Cambrian mini-men. Let's break this down. There is a bonebed consisting mainly of Shonisaurus vertebrae which are interpreted as having been deposited in deep water. In some odd twist of fate, the disarticulated vertebral columns of these elongate giant ichthyosaurs were (somehow!) fossilized in long rows. A reasonable person would look at this and think, "it's almost as if vertebrae are stacked in rows inside the body or something." An unreasonable person, like paleontologist(?) Mark McMenamin, would look at this and think "A sentient giant squid arranged these vertebrae like that in order to create a self portrait of its tentacles!" I'm sorry you had to subject your brain to that hypothesis. How such a travesty of logic made it into the abstracts of the 2011 GSA Annual Meeting in Minneapolis, I don't know, but if the scientific publication process works at all, it will not make it through peer review in a real journal. But, of course, that won't stop the media from credulously reporting every word as "new science" because, hey, everybody likes a good "Release the Kraken!" headline. Most disappointing is that even Science Daily, usually pretty good with the science reporting, ran this story without even a hint of skepticism. Not even a single quote from another scientist to say "um yeah, in case you didn't read what you just wrote, this is obvious BS." For shame. With that in mind, I want to start with a disclaimer: this kind of info only gets you so far. I'm not setting out to write the inerrant Bible of paleoart in these types of posts. Yes, all the evidence we have of dromaeosaurs shows full, lush feathering equivalent to small modern birds. But then again, we're dealing with small prehistoric birds here. 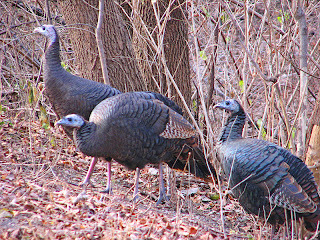 Yes, we can interpret feather coloration and use inferences from modern birds and biochemistry to say what colors are likely and which are unlikely; but we can't always identify structural color in fossils, and we have yet to identify carotenoids, and many small dinosaurs we think of as "carnivorous" might well have trended more toward omnivory, insectivory, etc., or other unforeseeable pathways to those tasty, tasty bright yellow pigments. Ok, preamble out of the way, the point of this post is to provide a general way I've used, and others can use, to try to make somewhat educated guesses about coloration in prehistoric birds which have not yet been analyzed for color pattern. A few people pointed out to me when this recent paper by Wogelius et al. 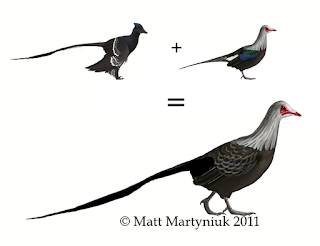 came out, in which the research team was able to identify color patterns in some Mesozoic birds using chemical markers rather than direct observation of melanosomes, that their reconstruction of Confuciusornis based on these findings was pretty similar to the restoration I'd done a while earlier. Above: Restoration of Confuciusornis by Richard Hartley, from the press release. Below: My own earlier restoration of C. sanctus. The two are pretty similar in the broad pattern: dark head, body, and coverts, white or light-colored wings with more black on the secondaries than the primaries. Now, so far this is only one data point, so I don't want to draw too many conclusions. But I was not simply guessing when I restored C. sanctus that way back in 2009. The trick is to understand what you're looking at when you see a fossil feather. These are often referred to as 'impressions', but often the impressions are only part of the story, or even completely absent from the fossil. The breakthrough that led Vinther , Prum and others to figure out how to suss out feather color, was in realizing what fossil feathers are made of. 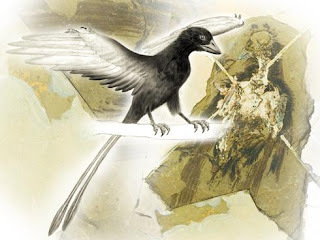 As Prum summarized on the Skeptics Guide to the Universe podcast a few years back, traditional wisdom held that the dark, 'carbonized' looking fossil feathers were the result of bacteria. Now, some old-school feather impressions, like those from Solnhoffen and the Santana formation, do contain nice, deep, actual impressions. These look very different from the stuff you find in the Jehol (compare the fossil feathers of the Berlin Archaeopteryx with the holotype of Microraptor gui). But most fossil feather,s including the famous single-feather holotype of Archaeopteryx and most Jehol stuff, are dark stains in the rock. Under the microscope, these looked to early researchers to be made up of fossil bacteria which had eaten away the feather keratin during decomposition. 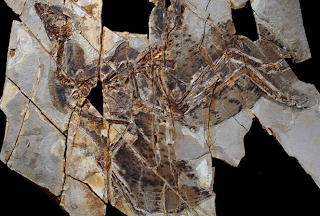 Above: Photograph of an unsubscribed Anchiornis specimen by Robert Clark, from National Geographic, showing clear color patterns matching those predicted by Vinther et. al. What Prum, Vinther, etc. showed in recent years is that this is flat-out wrong. Those granules are not bacteria--they're melanin! When you look at a fossil feather, most of the time, you're looking directly at the color pattern of the feather itself, the keratin and everything else having long since disappeared. This is especially apparent in very well-preserved fossils; for example, the beautifully preserved new Anchiornis specimen above is essentially proof of Vinther's hypothesis, which had previously been based on more obscured differences in shade. This is where my method of eyeballing it falls flat--I'd never have gotten the correct pattern from the specimen Vinther was looking at without really close physical examination. You need really nice specimens for it to conceivably work, or you have to Dave-Peters the heck out of low-res images trying to spot differences in contrast on the feathers. Luckily, Confuciusornis was a safe bet, because so many specimens are known, and you can start to see patterns emerge. Many of the best specimens tend to have a very dark halo of feathers around the body and arms, with the wing feathers very faint, even sometimes difficult to see at all. Knowing that dark feathers means dense melanin = dark coloration, and light color = lack of melanin = light color, it was easy to come up with a good guesstimate of the life coloration. This was first inspired by Longrich's work on Sinosauropteryx, showing that the apparent bands in the tail were due to color patterning, which was later supported by published studies. Obviously this is not a foolproof method. But it's a good place to start for artists who may want to add a little evidence-based thinking to their reconstructions, even if the evidence itself is wide open to interpretation. At the very least, if a good specimen has obvious areas of light and dark, I'd personally restore that pattern in a life illustration. It may end up being wrong, but it's better than pure speculation. Readers of this blog will definitely be familiar with all the standard complaints about dinosaur documentaries these days. Even old classics like Walking With Dinosaurs were heavily criticized by paleontology enthusiasts at the time for being too heavy on drama and too light on science. As a paleoartist, I love shows that attempt to reconstruct prehistoric life in a natural way, and all the necessary speculation that entails. But people are justified in pointing out that this doesn't exactly do wonders for public understanding of science. Sure, shows like WWD or even more sensationalist 'monster movie' type programs like Jurassic Fight Club create plenty of interest in paleontology and foster enthusiasm in young paleo fans, who can certainly be forgiven for being into the 'cool factor' and less into the hard science, which may well come with time. But these documentaries also blur the line between science, educated speculation, and pure fantasy. Use of talking head segments helps, but without weaving the science behind the entertainment into the body of the program, many people simply disregard it. Worse, producers have a tendency to edit the token scientist sound bites in a way which fosters stereotypes of scientific authority - talking heads are shown explaining that "yes, what you just saw is true" rather than explaining how we know this stuff in the first place, which is where the actual science is. Science is a process, not a set of facts spouted off by guys sitting in labs. Most dinosaur documentaries pay lip service to science as an excuse to sell entertainment, plain and simple. There is one very surprising exception: By far, the best dinosaur show produced in the last ten years in terms of actual science content is a cartoon aimed a preschoolers. Produced by Craig Bartlett with the Jim Henson Company for PBS and first airing in 2009, Dinosaur Train has now clocked in 40 episodes over two seasons. 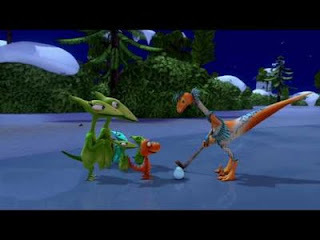 The aim of the series is to present science to young children in a way that is accessible and entertaining, and in that DT succeeds where pretty much every other dinosaur TV show in the past has failed. Each episode features two separate stories, all following the adventures of a Pteranodon family (included their adopted sibling, Buddy the T. rex, which is, based on the opening credits sequence, apparently the first recorded instance of nest parasitism in a non-avian theropod). The adventures consist of daily rides on the Dinosaur Train, a Doc Brown-esque vehicle which is capable of travelling to any time or place in the Mesozoic era (even under water in later episodes). Right off the bat, this provides ample opportunity to teach kids the basic (yet still occasionally missed or messed up in other media) idea that dinosaurs were often separated from each other by huge spans of time. I particularly liked the clever bit in one episode where the kids go to visit the one of the first dinosaurs, Eoraptor; reaching the end of the track somewhere in the Late Triassic, they have to get out and transfer to an old-style push-handle rail cart to go the rest of the way! The geographic separation of different dinosaurs is also emphasized, and in another cute touch dinosaurs are often given accents based on their country of origin. This theme of, essentially, biostratigraphy was the subject of an entire episode in which the Pteranodons attend a block party with their immediate neighbors (the ones featured on the show in their home time, before getting on the train). The neighbors include a Styracosaurus, Lambeosaurus, Daspletosaurus, a Euoplocephalus and Hesperornis. Savvy readers will probably recognize this as the Dinosaur Park Formation fauna, and while Pteranodon itself is the only one out of place there by a few million years, it's impressive to see a kid show try to get this kind of detail right while teaching a more basic lesson (that every member of a community has a role or niche). It's also funny to watch how the later plays out in the middle of an anthropomorphic, cartoon universe. On one hand, it's refreshing to the large theropods treated as characters who are friendly with the herbivores and not background monsters like in Disney's Dinosaur. On the other, this fact makes it even funnier/weirder in episodes that discuss the defensive tactics of some herbivores; for example, a group of stegosaurs have to group up and fend off a comically insane-acting, marauding allosaur. This kind of kid's-TV-paradox becomes even more acute in the episodes on marine fauna. I have to hand it to the producers for featuring such obscure critters as ancient fish and ammonites as characters, but it's also disconcerting in that almost every episode features the pteranodonts devouring heaps of these same fish! A bit like the Simpsons episode with Homer in an "Under the Sea" musical number gobbling down horrified anthropomorphic sea cucumbers? The producers do a good job keeping this kind of thing segregated, and I doubt the target audience would ever notice the inconsistency. 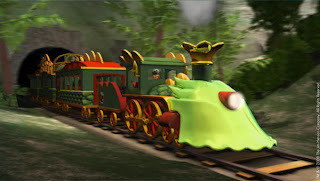 The best thing about the format of Dinosaur Train is that nearly every episode highlights and explains the scientific process in a really very deft and simple way that I think small children can understand, or at least in a way that gets them thinking scientifically at an early age. Buddy, the main T. rex character, is a very curious type who is always bugging the smart, train-conducting Troodon to answer questions his explorations raise. In case the show made it too charming and understandable to notice what's going on here, these are the first two steps of the scientific method--Buddy explores the word and forms questions based on what he sees. With the help of the conductor, the kids then do some research for background information on the topic, and then--get this--the kids explain to each other (and the audience) what a hypothesis is: "an idea you can test!" I don't want to sound condescending, but I've met adult science enthusiasts who seemingly have not yet grasped how science really works. Many casual dinosaur fans seem to think they need to find an idea and defend it to the death. 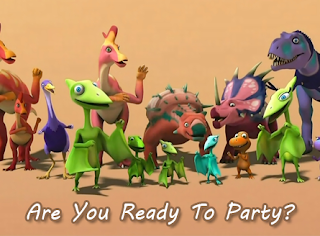 Dinosaur Train teaches children that they should think about the world around them, then ask questions. They should think of possible answers to their questions, and then try to prove themselves wrong! This is done so brilliantly it's almost sad to realize how easy it is to teach scientific thinking to people, most of whom have no idea what science is or how it operates, let alone to little kids. My favorite example of the show's handling of the scientific process is in the episode where the kids travel to Jurassic Germany to visit an Archaeopteryx. The conductor explains to them that Archaeopteryx is the first bird, and Buddy develops an hypothesis: if she is a bird, he reasons, she can fly and lives in a nest, like other the birds he's seen in his own time period. The conductor knowingly encourages him to test his hypothesis by talking to the Archaeopteryx. To Buddy's surprise, despite the fact that she is a "bird", and has wings, she does not have a nest and can't fly! Instead, the Archaeopteryx demonstrates how she can use her wings to run up a tree (first instance of WAIR portrayed in a dinosaur show?) and then can glide down after insects. Buddy's hypothesis was disproved, but he learned some even more interesting things by testing it. If only this kind of message could somehow be applied to standard, "adult" dinosaur shows. 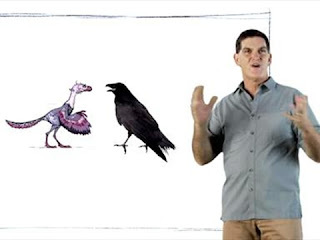 If the show itself doesn't amply demonstrate scientific concepts to children, each episode is followed by an epilogue featuring paleontologist Scott Sampson (who also has a blog, The Whirlpool of Life) explaining the main points again and giving some additional facts (some aspects of the show that rely heavily on anthropomorphism are sometimes hilariously shot down by a debbie-downer type stickler who pops out and says, for example, "Fact: Troodons did NOT play hockey!" followed by a chorus of disappointed kids). To follow in the stickler's footsteps (would it be Dinogoss if I didn't? ), I did see some missed opportunities in the premise of the show. It's impossible and silly to criticize a cartoon for accuracy ("Daffy Duck does NOT fold his wings correctly! "), but paleo fans will no doubt notice some glaring ones in the main cast. 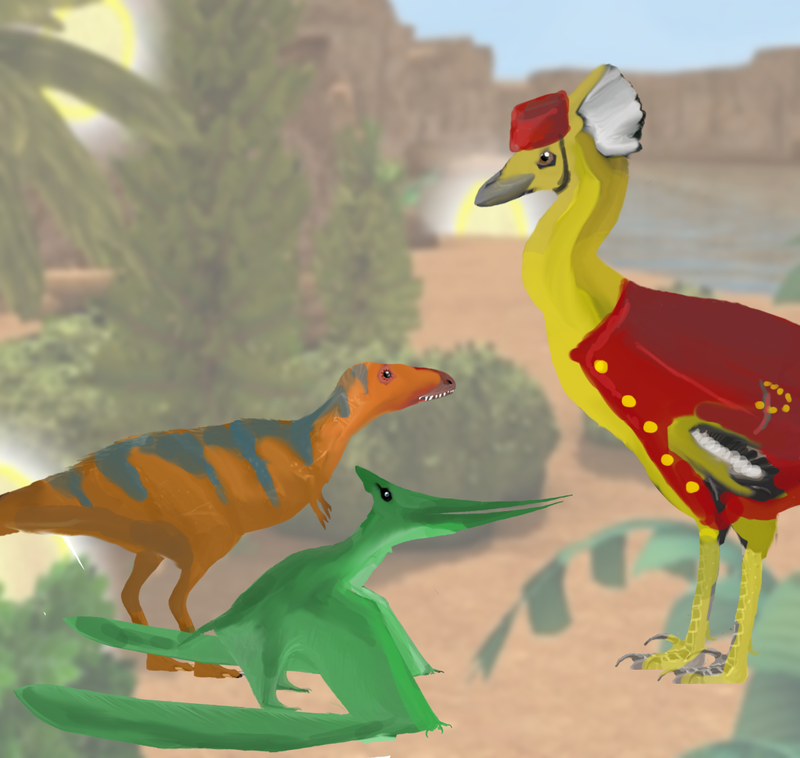 The Troodon are conspicuously lacking in feathers, and the Pteranodon appear to have bat-like wings (a condition not shared by other pteorsaurs in the show). This is a little baffling as the science consultants must have a very big hand in the production--most aspects of each episode, from colorful, feathered Velociraptor to Styracosaurus using their spikes for display rather than combat, are obviously based on the kind of up to the minute research only people active in the paleo community could provide. I'm betting that the main cast were designed and set in place before the consultants effectively took over--some later episodes show that the conductor is feathered, his feathers are just under is hat. His catch-phrase is the rather belabored "Bless my scales and feathers! ", probably modified at the behest of Sampson or another consultant taken aback by a Troodon, of all species, exclaiming "Bless my scales!" The family life of the pteranodonts rings false not for blatant inaccuracy, but for the fact that it's just the kind of interesting facts the bulk of the episodes would fall over themselves to include--the sexual dimorphism that could have been present between mom and dad, the fact that the eggs were likely buried rather than laid in a bird-like nest, etc. But none of this really takes away from the core value of the show as a tool for teaching science. For paleo fans, there seem to be some 'inside joke' type moments as well. Buddy was elated in one episode to be inducted into the "Theropod Club" . The club basically consists of a bunch of theropods getting together and patting themselves on the back for being by far the coolest dinosaurs - to the consternation of his friends. Nick Gardner could sympathize! Even here, though, the educational message is clear; it not only teaches kids what a theropod is, but often makes a point to explain why birds are also considered to be members. Buddy, apparently a budding comparative anatomist, is also prone to getting really excited over "comparing features", to the point that in at least one episode, when the kids were suggesting games to play during a long train ride, his suggestion to compare features with other dino passengers was met with groans and eye-rolls (maybe the pterosaur kids are more in the geological school--they do like to collect rocks, and at least one entire episode has been dedicated to geology rather than dinosaurs themselves). At any rate, this is in my opinion the best science show made for young kids, at least those still too young for Bill Nye, and I'd encourage any dinosaur fans to check it out. Despite the target age range, it's fun to see how the new discoveries we follow on a day to day basis are being communicated effectively to the next generation. Before writing up a big review post for tomorrow, I thought I'd address a request I've gotten a few times, most recently over on my deviantArt page. I've written a few times about old/disused names that have fallen out of fashion in paleontology with little reason (or for reasons that can't really be supported by evidence). In fact, a lot of these 'quaint' or 'old-fashioned' sounding names should really be considered just as valid today as when they were coined. Now, keep in mind that at least in cases of priority for family-level names, it has been argued that anything goes, because researchers are not necessarily using these names as 'families' under the ICZN but identical clade names that fall under no governing code. In my opinion this is a bit of a cop-out, and a bit hypocritical when espoused by people who would otherwise argue that nomenclature needs to do its best to reduce confusion. I agree with some PhyloCode proponents that, for this reason, endings like -idae should be avoided in clade names at all costs, or at least, those names should be defined in such a way that they roughly correspond to their traditional family name homonyms. There has been a general tendency in the past few decades to somewhat arbitrarily replace names based on fragmentary taxa with those based on more complete (or simply more famous) taxa. This, again IMO, ultimately negatively impacts stability of nomenclature, despite the fact that many of these 'replacement' names have since come into such common use, coinciding with widespread use of the Internet, that changing them back now gives a false impression of instability. Luckily, some more recent research is beginning to correct a few of these mistakes of recent history. Megalosauroidea (a name based on a fragmentary taxon) had long been replaced by Spinosauroidea (a name based on a different but more apomorphic fragmentary taxon) in the literature, but several recent papers by Benson and colleagues have argued fairly successfully for a reversal of this trend and a return to valid priority. In a way, it's a shame that the PhyloCode will not give priority to the original author of a name, but rather to the author of its definition, essentially enshrining unjustified replacement names like Coelophysidae in favor of older names like Podokesauridae, robbing the original authors of their rightful credit. It would upset temporary stability (or rather, reverse prior results of instability) but ultimately make more sense to automatically give preference to the older names and their authors, even if they aren't converted to clades immediately when PC goes into effect. Anyway, here I'll give a brief rundown of some disused names that should still by all rights be considered valid senior synonyms of other names. I'll also throw in a few genera that may have a claim to seniority over more widely used, better known names. Note that this later bit is a completely separate issue--seniority for family-level names is straightforward. At the genus or species level, as I've argued before, often names are ignored as unofficial "nomina dubia". Nomen dubium refers to a name based on a specimen which lacks key apomorphies and cannot be distinguished from two or more similar specimens. However, in many cases I believe stratigraphy itself should be taken into account. If a bone fragment is obviously from a allosaurid theropod, and current evidence only supports the presence of one other such theropod in its stratigraphic level, parsimony dictates they should be considered the same taxon. If and when evidence is found to support the presence of multiple allosaurids in that formation, then and only then can non-diagnostic allosaurid remains be declared nomina dubia. One more note on nomina dubia: the ICZN does not support the existence of this concept (and as far as I know, neither does the PhyloCode). According to the ICZN, if a type specimen is found to be non-diagnostic relative to more complete specimens, the name should not be ignored--rather, one of those more complete specimens should become the neotype of the oldest available name. So, for example, Deinodon (see below) should not simply be ignored as non-diagnostic relative to Gorgosaurus and Daspletosaurus and then ignored; rather, scientists should have arbitrarily chosen one of those two specimens to become the neotype, removing the validly published name from poor material and leaving the poor material nameless. This is, of course, almost never done, especially among paleontologists, where making sure your name is the one that sticks has historically been a higher priority than eliminating nomenclatural clutter (whether or not scientists who name scrappy material have more of a right to their names to persist than those who describe complete specimens is another story). Podokesauridae (Huene 1916) is perhaps the classic example of a valid taxon name abandoned for no good reason. 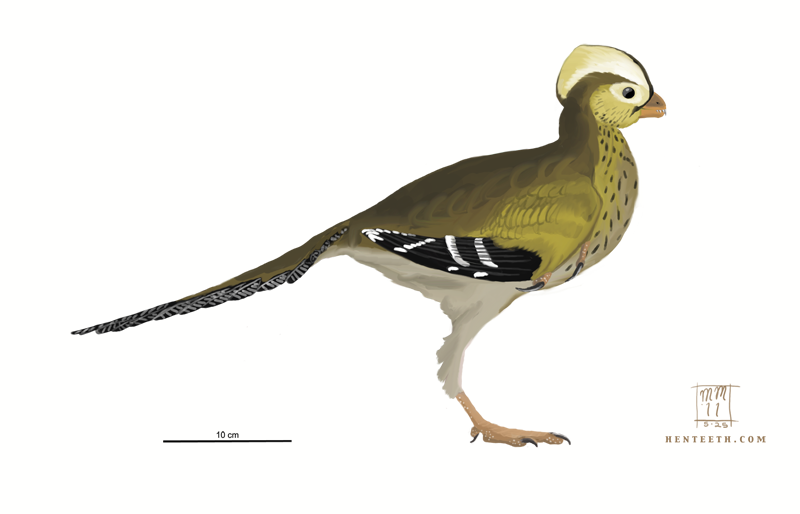 In use up until the early 1990s, the name was suddenly changed to Coelophysidae (Nopcsa, 1928) when Holtz and Sereno began to fist include this group in phylogenetic analyses. As far as I know no justification for this was ever given, but I don't have these initial papers to check. At any rate, the type specimen of Podokesaurus has been distinguished from Coelophysis by researchers going back to Colbert in the 1950s, so it is by definition not even a nomen dubium. There is therefore no justification to ignore this name in favor of Coelophysidae/Coelophysoidea etc. Metriacanthosauridae (Paul 1988) is another case like Podokesauridae where a perfectly valid name based on diagnostic material was arbitrarily replaced by its junior synonym, Sinraptoridae (Currie & Zhao 1994) among most researchers. Nobody doubts the diagnosibility of Metriacanthosaurus as far as I know, and as discussed, this doesn't matter anyway. Megalosauroidea (Huxley 1869), as discussed above, is a senior synonym of Spinosauroidea (Stromer 1915). Again, Spinosauroidea gained broad acceptance in the early '90s, but several recent papers have been effective in reversing this baffling trend to arbitrarily ignore a widely used name with a history almost as long as dinosaur paleontology itself. Omnivoropterygidae (Czerkas & Ji 2002) is another case where a once-ignored name is starting to gain traction again in favor of its junior synonym Sapeornithidae (Zhou & Zhang 2006). Both Greg Paul and Tom Holtz have used the correct name in recent popular works, though Sapeornithidae still crops up in the technical literature. This name is an even better illustration of the Czerkas problem. People who favor the junior Epidendrosaurus over Czerkas' senior Scansoriopteryx can at least fall back on the online vs. print publication excuse (though the ICZN is clear and unequivocal on the matter). In the case of this family name (neither have yet been defined as clades), Czerkas' name has 4 years of priority and is still ignored. Let's not beat around the bush--people disagree with Czerkas' conclusions and don't like the way he has (validly if unpopularly) published many of his taxa, and they express this distaste by ignoring his taxonomy. The ICZN has no provision to replace names created by unpopular scientists. Ornithodesmidae (Hooley 1913) has priority over the better-known Dromaeosauridae (Matthew & Brown 1922). The scrappy type specimen of Ornithodesmus, though initially (correctly) identified as a primitive bird, was soon confused with the much better remains of the pterosaur now known as Istiodactylus. Hooley named Ornithodesmidae as a family of pterosaurs, but it became a theropod family when Ornithodesmus was again recognized as a maniraptoran in 1993. Naish & Martill (2007), as well as Makovicky & Norell (1995), and Mortimer (online) have shown that Ornithodesmus falls into the same family as Dromaeosaurus. So, unless Dromaeosauridae is re-defined to include only Dromaeosaurus and a few closely related taxa (~current Dromaeosaurinae) or trated as a synonymous but differently goverened clade (under the future PhyloCode), Ornithodesmidae has clear priority of name under the ICZN. Atlantosauridae (Marsh 1877) has clear priority of name over the more well known Diplodocidae (Marsh 1884), and Hay (1902) argued that it has priority over Amphicoelidae (Cope 1877). Atlantosaurus is almost certainly a synonym or close relative of Apatosaurus, and while it may be a real nomen dubium in relation to the various species of contemporary atlantosaurine (=apatosaurine) sauropods, it is definitely a member of this group, and thus higher taxon names should be used accordingly. Even if a taxon is a nomen dubium, there is no reason to change higher taxa names based on it if it can be confidently classified at the 'family' level (as is the case with Ceratopsidae). Again, Atlantosauridae has not yet been defined as a clade, so if Diplodocidae is defined first under parallel systems such as PhyloCode, a situation will arise where Atlantosauridae is valid under one code but not the other--Diplodocidae will be a valid name but for a clade, not a family. Olshevsky (1991) incorrectly labelled Atlantosauridae a nomen oblitum (forgotten name). The ICZN states that to be a nomen oblitum, a name must not be treated as valid in the scientific literature after 1899. However, Atlantosauridae was in use in papers by Steel (1970) and Nowinsky (1971) well into the late 20th Century. Deinodontidae (Cope 1866) is a slightly more complicated case than the above. It was in clear, widespread use through the mid 20th Century (as in Maleev 1955) and almost always treated as the senior synonym of Tyrannosauridae (Osborn 1905). However, Russel (1970) argued that Deinodontidae be abandoned, because he considered the type specimens of Deinodon (isolated teeth) not diagnostic, rendering the name a nomen dubium. However, the teeth are clearly diagnostic at the family level and possibly even genus and species, as they must have come from either Daspletosaurus or (more likely) Gorgosaurus, and the rocks those dinosaurs come from are well enough sampled to rule out the presence of a third large tyrannosaur species unless such compelling evidence is found. Similarly, it is questionable whether or not the pertinant ICZN rules allow for abandoning a name due to a dubious type genus. Even if this is the case, it is only followed sporadically in the literature, and many family names remain in use that are based on dubious type material, including Hadrosauridae, Ceratopsidae, and Troodontidae (the latter is also based exclusively on teeth of questionable diagnosability at the genus and species levels). Olshevsky (1991) recognized this, but argued that the name is still invalid because Cope initially spelled it Dinodontidae, and the name Deinodontidae was an emended spelling not published until 1914, after Tyrannosauridae. He concluded that therefore Deinodontidae (with an e) is a junior synonym and Dinodontidae (no e) is a nomen oblitum. However, Olshevsky's argument is incorrect because the ICZN clearly mandates that any family names based on misspellings or unjustified spelling changes of their type genus (Cope spelled the name Dinodon) can and must be emended by any subsequent revisor, and that this does not change the original authorship or date of the name (ICZN Article 35.4.1). Also, note that even if Deinodontidae and Deinodontoidea are ignored, several studies have found Coelurus fragilis to be a "tyrannosauroid", and so the next available name for that group after Deinodontoidea is Coeluroidea (Marsh 1881). Trachodontinae (Lydekker 1888) may have priority over Lambeosaurinae (Parks 1923). As discussed below, the Trachodon holotype teeth may be diagnosible to subfamily level, as some researchers have suggested that they belong to a 'lambeosaurine' rather than a 'hadrosaurine/saurolophine'. If this is the case, even if Trachodon is itself a real nomen dubium (which it probably is), the family name would still carry priority. Titanosauridae (Lydekker 1885) is, despite being based on a possible nomen dubium, a valid taxon name. However, this situation is complicated for a new reason: the 'family' has proven so large that most researchers now divide it up into several families. If multiple families of titanosaur are used, Titanosauridae itself (but not Titanosauroidea) must be restricted to its dubious type species. This is analogous to the Ornithodesmidae situation described above: if 'dromaeosaurids' were divvied up into several families (Microraptoridae, Velociraptoridae, Saurornitholestidae, Dromaeosauridae), then Ornithodesmidae would still be valid but monotypic, and probably (rightly) fall out of use again. Hylaeosauridae (Nopcsa 1902) is a senior synonym of Polacanthidae (Weiland 1911), but this is another situation where a name is only valid under certain classifications. Some older classifications placed the group as separate from Ankylosauridae and Nodosauridae, or as a subfamily of either (as Polacanthinae). In these cases, Hylaeosauridae/inae has priority. However, some new studies show the 'polacanthines' the be nested within nodosaurs, and to be possibly paraphyletic. Nodosauridae (Marsh 1890) has priority over both Polacanthidae and Hylaeosauridae, so both names are sunk either way. This last one isn't a dinosaur group, but is quite an odd situation. As it turns out, Pterodactyloidea (Meyer 1830) has, according to the principal of coordination, priority over the widely-used pterosaur group Ctenochasmatoidea (Nopcsa 1928). Note that this is a different taxon than Pterodactyloidea (Pleininger 1901), traditionally labeled as a suborder. But... they have the same name. This isn't technically a problem because the later Pterodactyloidea, named as a group above the rank of superfamily, is outside any governing code, and practically, nobody uses the superfamily Pterodactyloidea (or Rhamphorhynchoidea, for that matter). But those have priority over other names, which makes them more valid than the suborder name, which can easily be replaced with a new name the way Segnosauria was replaced with Therizinosauria (neither of them governed by the ICZN, so anarchy applies). Deinodon horridus (Leidy, 1866) currently appears to be a real nomen dubium, as it is based on deinodontid teeth from the Judith River Formation. I say currently because its status depends on the currently messy taxonomy and stratigraphy of the various specimens/species assigned to Daspletosaurus. Daspletosaurus is not present in the Judith River formation sensu stricto, and is generally known from younger deposits than the chronologically-overlapping albertosaurine species Gorgosaurus libratus. However, specimens that may or may not be Daspletosaurus are known from such a wide temporal and geographic range that it's possible these teeth could belong to it (or a similar tyrannosaurine) instad of Gorgosaurus. Additionally, if it ever is demonstrated to be possible to distinguish between albertosaurine and tyrannosaurine teeth, Deinodon can and should be ressurected to replace one of these two genera. Note that Matthew & Brown 1922 considered both G. libratus and Albertosaurus sarcophagus to fall within the genus Deinodon--this is dependent on subjective lumping vs. splitting (if libratus and sarcophagus are placed in the same genus, and Deinodon=Gorgosaurus, Albertosaurus is also a junior synonym of Deinodon), and ignores the possibility that Daspletosaurus represents the true skeleton of Deinodon. For now, Deinodon must be considered a nomen dubium. Trachodon mirabilis (Leidy 1856) was named for isolated teeth of a hadrosaur (and some mixed in from a ceratopsian), Also from the Judith River formation. 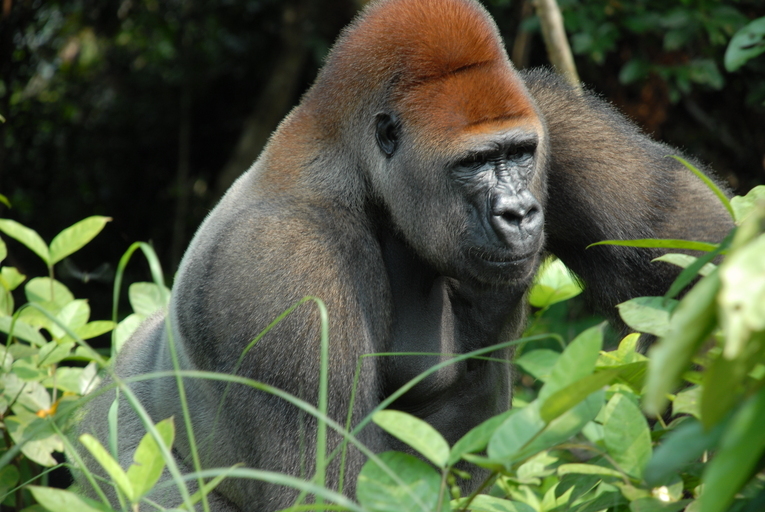 As mentioned above, they may be diagnosable to the level of Lambeosaurinae (=Trachodontinae?). I'm not knowledgable enough about hadrosaurs to know if this species might be currently valid based on stratigraphy. As far as I'm aware, no definite remains of named lambeosaurines are known from the Judith River formation, though this spans a great deal of time and in places overlaps with the Oldman and Dinosaur Park formations of Canada, which contain numerous lambeosaurs at different and better-studied stratigraphic levels. If anybody knows approximately which portion of the Oldman/Dinosaur Park group this part of the Judith River corresponds with, we might be able to find an answer. Antrodemus (Leidy 1870) has long been recognized as a possible synonym of Allosaurus (Marsh 1877). In fact, I remember making a note 'alos known as Antrodemus' in one of my dinosaur books in the '80s (sticklerism arises early!). As Mickey Mortimer points out on the Theropod Database, Chure (2000) noted that the species of Allosaurus Antrodemus comes from can't be determined, but Chure doesn't consider it a synonym of Allosaurus because it comes from an unknown quarry. I would agree with this, as long as there are multiple genera of allosaurids recognized in the Morrison (i.e. Saurophaganax). If, however, one were to synonymize Saurophaganax and Allosaurus, the name for this genus must then become Antrodemus, no matter how many diagnosable species it contains (Antrodemus valens, the species, would still be a nomen dubium). I'm sure there are other dinosaurs that could be added to this list, and I may try to do a 'part 2' someday. I've discussed the situations about the Lancian forms Manospondylus, Agathaumas, and Thespesius before. Stay tuned for something a little less arcane, nitpicky, sticklerish, and taxonomical. The next post will be (gasp!) an unabashedly positive review of possibly the best dinosaur show ever to make it to air. Above: Maximum wrist folding for the theropods studied by Sullivan et al. 2010. Not to scale. To continue talking about aspects of maniraptoran anatomy that can be a bit vaguely defined in the minds of paleoartists, I'm going to write a bit on the issue of wrist folding. As most of you will know, a major characteristic of maniraptorans is the semi-lunate carpal, the half-moon shaped bone in the wrist that allows the blade of the hand (metacarpal 3) to fold backward toward the forearm (ulna). While this is common knowledge among paleo buffs and artists, what seems to be less understood is exactly how tightly the hand (and in aviremigians, the wing) could actually fold up. I myself have never been too clear on the issue, and there don't seem to be many papers addressing this. But in the last few years, a few papers have come along that can help shed light on the subject. The first was Senter 2006, which studied the full range of motion in the forelimbs of two dromaeosaurs, Deinonychus and Bambiraptor. The second was Sullivan et al. 2010, which examined the range of motion in the wrist of several species representing each major group of non-avialan maniraptorans. Both papers, however, present geometric data that can come across as a bit inaccessible for your average artist, so I'm going to try to break down their conclusions for those of us who are more visual thinkers. The Sullivan paper, in particular, discusses the degree to which the wrist could fold, but doesn't necessarily provide diagrams or even final angle between the metacarpals and ulna for each species that could be used as a simple reference. I've done my best to translate their findings into the image at the top of this post, using modified skeletal diagrams by Scott Hartman and Jaime Headden. The degree of wrist folding is controlled by two wrist bones. The cuneiform, on the inside where the wrist meets the bottom of the distal ulna, provides an inner limit. The cuneiform blocks the hand from actually touching the ulna. The radiale, on the outside of the fold, forms the surface which the wrist cannot fold beyond. This is basically a little process anchored to the tip of the radius where the top part of the hand articulates. The hand can obviously not fold beyond the angle of the radiale, or the animal would dislocate its wrist. Therefore, the angle the articular surface of the radiale forms with the ulna is used as the key factor in determining maximum wrist folding by Sullivan et al. Again, see my interpretation at the top for how their results likely translate into life position. The wrist is located about where the coverts form the point of a triangle, following the line formed by the border of the the brown secondary (ulna) feathers and white banded primary (metacarpus) feathers. Note that with the wrist folded at a 57 degree interior angle, the feathers (especially the secondaries, which help cover the primaries when folded) are basically stacked one on top of the other with little to no fanning out at the tips. This is because the feathers also have some ability to move at their bases, and can themselves fold relative to their anchor bones through muscle and ligament action. Looking at the aviremigians in the diagram up top, it is apparent that their wrists could not fold tightly enough to fold the wing feathers to the same degree as a modern turkey. 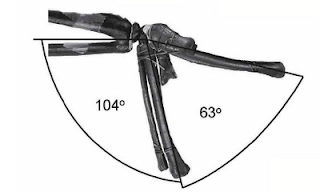 Small deinonychosaurs like Sinovenator and Bambiraptor could achieve close to a 100 degree angle (see image of Bambiraptor wing folding above, from Senter 2006), but larger ones like Deinonychus seem to have lost some of that folding ability, presumably for increased use of the forelimbs in predation. Indeed, if Deinonychus retained long remiges, they would hardly have been able to fold at all, and would have been permanently fanned out (not that this would have gotten in the way of grabbing prey, as Senter pointed out). This lack of ability to tightly fold the wrists may have posed a significant problem for those species with very long remiges, like Microraptor gui. Dave Hone, who was a co-author of the Sullivan paper, discussed alternative ways they could have kept their remiges free of the ground at his blog last year. In pygostylians, the degree of wrist folding began to approach that found in modern birds. 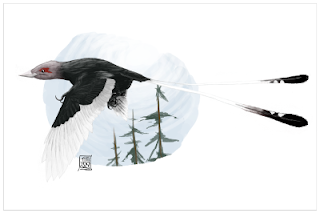 Eoconfuciusornis, for example, could fold its wing to about the same degree as a turkey. Where it gets weird is in the oviraptorosaurs. As I mentioned in my post on the Ashdown maniraptoran, oviraptorosaurs (at least the small basal ones like Caudipteryx) seem to have been capable of folding their wings far beyond what is possible for even many modern birds. 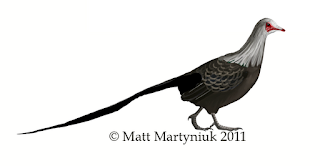 It's unclear why this is so, especially as the remiges of Caudipteryx, while clearly for display, are not exactly very long compared to the body. Certainly its wings were much smaller than those of paravians, which would have presumably had more need to fold them up. I've seen this mentioned as possible evidence in support of the hypothesis that oviraptorosaurs are in fact avialans, and that the extreme folding of the wrist was inherited from flying ancestors, though I can't think of where. Sullivan et al. do note that more than folding up the remiges to keep them safe from wear and tear, wing folding is an important part of the avian flight stroke, and it makes sense that it would have become more developed in flying forms. Anyway, we've only got a handful of specimens that have been specifically studied in regards to the degree of wrist folding, and there may well be exceptions in each maniraptoran group, where certain lineages independently evolved a greater or lesser degree of wrist folding from their ancestors as seems to have happened in therizinosaurs, where the derived Alxasaurus can fold its wrist more than the basal Falcarius, and deinonychosaurs, where the relatively derived Deinonychus can fold its wrist less than the more basal Bambiraptor. So this guide shouldn't be considered as a set of hard and fast rules, but rather a starting point for artists who want to make their restorations as plausible as possible. Finally, a few days ago I posted a teaser for this post challenging people to determine what aspect of the above Deinonychus illustration was incorrect. By now it should be clear that the wrist is folded too far back. Appropriately enough, the first one to nail it was the artist, Nobu Tamura, himself! Commenter A.G. came close, speculating that it was due to the orientation of the glenoid, but that has more to do with the range of motion of the upper arm and how far it could extend into a bird-like flapping position, rather than the way the wing folds up. Good job guys! * Senter, P. (2006). "Comparison of Forelimb Function Between Deinonychus And Bambiraptor (Theropoda: Dromaeosauridae)". Journal of Vertebrate Paleontology, 26(4): 897–906. * Sullivan, C., Hone, D.W.E., Xu, X. and Zhang, F. (2010). "The asymmetry of the carpal joint and the evolution of wing folding in maniraptoran theropod dinosaurs." Proceedings of the Royal Society B, 277(1690): 2027–2033. As you may have heard by now, Darren Naish and Steve Sweetman have described an incredibly small, yet apparently adult, cervical vertebra of a maniraptoran dinosaur from the Wadhurst Clay Formation. My first reaction upon seeing pictures of this nice little water-polished bone was "that is effing adorable," followed by "I need to restore this despite the fact that we can have no clue what it looked like." So I did, and the result is shown above (and on my deviantArt page). 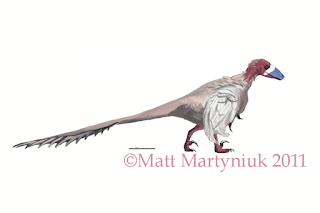 Let me emphasize again: this is a *highly speculative* restoration of the so-called Ashdown maniraptoran. Darren did a great job of discussing the new paper at TetZoo, so I won't go into details here. While it is entirely speculative, based as it is on a single bone, it is possible to make some educated guesses about life appearance. Naish and Sweetman note several characteristics of the vertebra that are similar to oviraptorosaurs. However, it is from the early Valenginian age, about 140 million years ago. This is nearly 20 million years earlier than the oldest known definitive oviraptorosaurs, Caudipteryx and Protarchaeopterx. So, I essentially restored this as a very small protarchaeopterygid-grade animal, hence the short tail and tightly-folding wing feathers (oviraptorids could fold their wings more tightly than even many early birds). There is also some influence from scansoripterygids, given its small size (and as a slight nod to GSP's interpretation of Epidexipteryx hui as a basal oviraptorosaur). Naish and Sweetman point out that the large neural canal of the vertebra is a characteristic of Avialae, but that it may also be a more general size-related character. The scansor influence is found mainly in the shape of the skull and the large procumbant teeth, but those these are the characteristics which are shared by early oviraptorosaurs anyway, and so allow extra wiggle room should it turn out to be closer to avialans. I made the legs quite long compared to the ratio seen in its larger possible relatives, and made the foot fairly large (to better emphasize the diminutive size). The longer legs would, I reckon, help escape hungry mammals, lizards, and whatever else was preying on tiny maniraptors. Finally, the coloration is fairly drab and cryptic (inspired by small modern birds that spend time hiding in undergrowth) and I chose yellow hues to indicate a bit of an omnivorous diet. So, while it's impossible to accurately depict an animal based on a single bone which we have trouble even assigning to any specific clade, using some knowledge of basal maniraptoran lineages (it is almost certainly a fairly basal member of whichever clade it belongs to, given its early age), we can make some pretty reasonable (I hope!) guesses. * Naish, D., and Sweetman, S.C. (2011). "A tiny maniraptoran dinosaur in the Lower Cretaceous Hastings Group: evidence from a new vertebrate-bearing locality in south-east England." Cretaceous Research, 32: 464-471.